The smaller, though heavier white dwarf in HM Cancri pulls gas away from its larger companion. The stars orbit each other in a record 5.4 minutes. 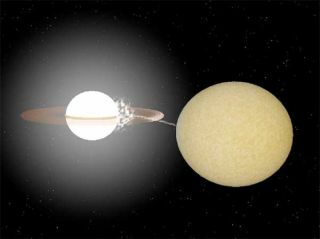 Aftera decade of mystery, astronomers have now shown that a pair of white dwarfstars spin around each other in just 5.4 minutes, making them thefastest-orbiting and tightest binary star system ever found, the researchersclaim. Therecord-setting stellar duo, known as HM Cancri or RX J0806.3+1527, offer challenges in explaininghow such a system might form. The super-quick stars may also present a greatfuture test-bed for detecting gravitationalwaves, which are elusive ripplesin space-time. Researcherssay the stars in HM Cancri are so near to one another ? about a quarter of thedistance between the Earth and the moon ? that they could not get much closerwithout smushing together.? "Afive-minute orbit is about as close as two white dwarf stars can get withoutmerging," said Danny Steeghs, an astrophysicist at the University ofWarwick, and co-author of a new paper describing the results. Whitedwarfs are the white-hot cores left over from stars that have sloughed off theirouter, cooler layers while aging several billion years longer than our sun. Paradoxically,smaller whitedwarfs are more massive than bigger, puffier white dwarfs, given thesestars' extreme densities. Inthe case of HM Cancri, this phenomenon has led to the smaller, though heavierstar gravitationally stealing matter from its nearby companion. A ring of gashas likely formed around the smaller star, while altering the appearance of thedonor dwarf.? "Themore massive star is distorting the shape of the lighter one into that of apear, or a raindrop structure," said paper co-author Arne Rau, a post-doctoralresearcher in astrophysics at the Max-Planck Institute for Extra-TerrestrialPhysics in Germany. Matterstriking the heavier star unleashes bursts of light and energy, which is whatfirst drew astronomers' attention to HM Cancri more than 10 years ago. Thisperiodic brightening as the stars revolve about each other implied theastounding 5.4 minute orbital period, which astronomers initially were at aloss to explain. Severalalternative scenarios about HM Cancri, such as magnetic field interactions ofmore typically spaced-out, slower dwarfs, had been proposed over the years. Badweather had scuttled many previous attempts to get a sharper look at HM Cancri. Tofinally nail down the orbital period, an international team of astronomers madefresh, clear observations of the stellar duo last year with the Keck Itelescope atop Mauna Kea, Hawaii. SimonAlbrecht, a postdoctoral researcher at MIT who studies binary star systems butwas not involved in this research, says he finds the data analysis "thorough,"though researchers have had to make a few assumptions about the nature of theHM Cancri system. Exactlyhow HM Cancri got to look the way the paper's authors think it does now remainsrather puzzling, said Steeghs. The stars that smoldered down into HM Cancri'swhite dwarfs must have initially been much farther apart, given how littlespace remains between them now. Twostars similar to our sun, yet with one initially about twice as massive as theother must have ended up having their life cycles timed so that this evolutioncould occur, Steeghs said. Further study of HM Cancri may inform models of howbinaries interact with each other over lifetimes that last billions of years. Inany case, as they have wound closer and continue along at their currentbreakneck pace, HM Cancri's stars should shed energy in the form ofgravitational waves. These ripples in space-time were first predicted by AlbertEinstein as part of his generaltheory of relativity in 1915, but have yet to be directly detected. GivenHM Cancri's properties and relative closeness within the MilkyWay galaxy, Rau thinks the two quick stars' gravitational waves will beright in the range of frequencies detectable by the space-based LaserInterferometer Space Antenna (LISA), set to launch later this decade. "HMCancri has the shortest orbital period we know, and is therefore the mostinteresting system to find gravitational waves," Rau told SPACE.com. Theresearch was published in the March 10 issue of Astrophysical Journal Letters.